Of all cetaceans they have the shortest lifespan. Capable of reaching up to 20 years, but rarely do, the average life is around ten. Sexual maturity is reached at three to four years with females gestating for approximately 11 months. Only one calf is born annually, which means the porpoises reproductive life is extremely short. Calves are born at around 70 centrimetres long and have a strong bond with their mother. Males play no part in the upbringing of the offspring. Weaning can ocur quickly and individuals as young as six months have been known to become independent. 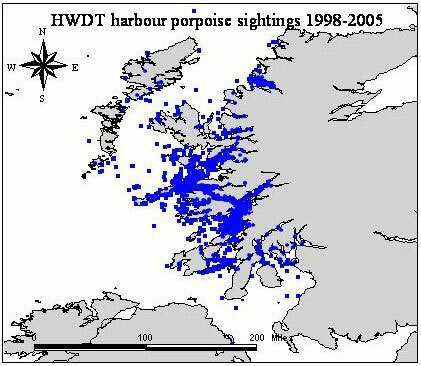 With such a short lifespan and reproductive life harbour porpoises are highly susceptible to sudden decreases in local populations. The harbour porpoise is the most widespread, commonly seen and studied of all porpoises. They are very shy animals and only show their backs and dorsal fin when surfacing the water. One of the harbour porpoises names, the puffing pig, is derived from the noise of its blow when they surface the water for air. The noise made sounds like a human sneezing or puffing. Living in cool temperate waters the porpoise has a high metabolic rate, therefore the less choosy they are with their diet, the more successful they will be finding a meal. Their diet consists of over 20 different species of fish, squid, octopus and shellfish. Herring, sprat and sandeels make up a large part of the diet porpoises around the Isle of Mull and the small Isles. They hunt singly or in small groups, usually including 2 to 10 individuals. They are quite accomplished divers and when feeding may surface to breathe about four times every 10 to 20 seconds before diving for up to six minutes. They can reach dpths of over 230 metres. As with whales and dolphins they use echolocation when exploring the surrounding environment. Porpoises are also hunted themselves, by larger predators in the waters of the Hebrides, these are killer whales, which also hunt their prey in packs. Around the whole of the British coast, at least 10,000 porpoises are dying every year as a result of being mistakenly caught in fishing nets, mono-filament gill-nets. They drown and are usually already dead when hauled aboard. This by-catch, scientists believe, is not sustainable and will certainly be damaging to future populations of British harbour porpoises. Pollution is possibly the most serious long term threat faced by porpoise and other marine animal, populations, as we still do not fully understand the problems which marine pollution will bring in the future. Harbour porpoises are found in the temperate waters of the northern hemisphere in a nearly circumpolar distribution (see map). They generally inhabit coastal waters with a depth of less than 150 meters, and their common name is derived from their regular appearance in bays and harbours. Many populations of harbour porpoises are migratory. Harbour porpoises are one of the world’s smallest cetaceans, growing to an average length of 1.55 m and a mass of 55 kilograms. Female porpoises are usually larger than males. It is believed that porpoises can live as long as 20 years. Harbour porpoises become sexually mature between 3 and 5 years of age. After that time, female porpoises usually produce one calf every year. Porpoises feed on herring (Clupea harengus), capelin (Mallotus villosus) and gadoid fishes such as pollack (Pollachius virens) and hake (Merluccius bilinearis). Porpoises also eat squid. Recently weaned porpoises eat euphausiid shrimp. Harbour porpoises are deep divers, capable of reaching depths in excess of 200 meters. Many harbour porpoise populations around the world have been depleted through bycatch in fisheries. This has led some countries to afford them special status. In Atlantic Canada, harbour porpoises are listed as threatened by the Committee on the Status of Endangered Wildlife in Canada (COSEWIC). Northwest Atlantic harbour porpoises are currently designated as a strategic stock under the U.S. Marine Mammal Protection Act (MMPA) because current levels of killing exceed the estimated Potential Biological Removal (PBR) level for the population. Harbour porpoises are listed in the IUCN Red List of Threatened Species as vulnerable throughout their range. Porpoise populations throughout their range continue to be threatened by incidental mortality in many fisheries. In North America alone, bottom set gill nets catch hundreds of porpoises yearly. Chemical and noise pollution may also threaten this species. Gaskin, D.E 1983. The Ecology of Whales and Dolphins. Heinemann Educational Books Ltd, London. 459pp. Gaskin D.E. 1992 Status of the harbour porpoise, Phocoena phocoena, in Canada. Can. Field Nat. 106:36-54. Palka et al. 1996. Summary of current knowledge of harbour porpoises in US and Canadian waters. Rep. Int. Whal. Commn. 46:559-565. Read, A.J. 1999. Harbour porpoise (Phocoena phocoena) In S.H. Ridgeway & R. Harrison [eds. ], Handbook of Marine Mammals, Volume 6: The Second Book of Dolphins and Porpoises. Academic Press. San Diego. Trippel et al. 1996. Incidental mortality of harbour porpoise (Phocoena phocoena) by the gill-net fishery in the lower Bay of Fundy. Can. J. Fish. Aquat. Sci. 53(6):1294-1300.